A historical library over 100 years old, the creation of the New York Public Library on 5th Avenue was considered one of the first steps in creating a unified library system in the City of New York. 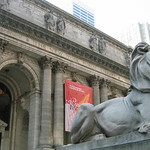 With a massive collection on a number of resources and services and map division, the NYPL of Humanities and Social Sciences is located on 5th Avenue and is home to the famous Library Lions: Patience and Fortitude. Please call or check the library to learn about all of their free services and free events!